Hong Kong style Racketlon art. (Both pictures are from last year's tournament that became the first Racketlon tournament in Asia(!) 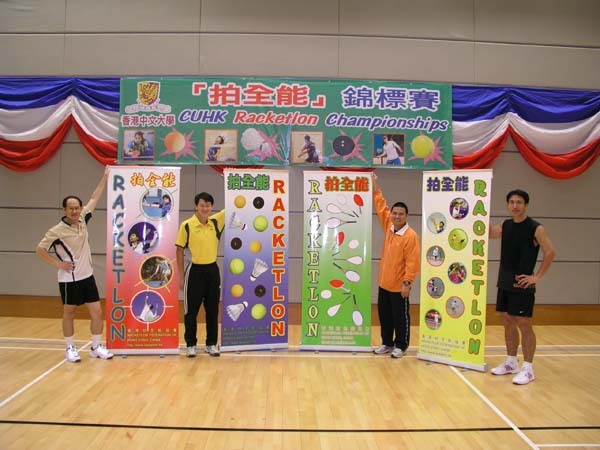 - see report..
CM Chan, the Chairman of the Racketlon Federation of Hong Kong, today reported to Racketlon.com that the Physical Education Unit of The Chinese University of Hong Kong will host The 2nd CUHK Racketlon Championships 2007 on Sunday, 1st April 2007 at the University Sports Center. The number of participants has increased from last year's 36 to 50 (18 staff (16 men, 2 women), 32 students (24 boys, 6 girls)). Players are guaranteed at least two matches in the round robin format of the first round. 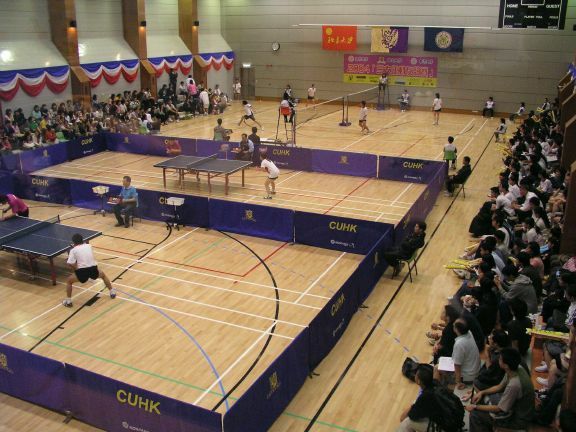 Winners of the CUHK Championships will be selected for the CUHK Racketlon Team to take part in the CUHK Inter-Universities Racketlon Team Championship also hosted by CUHK on Sunday, 15th April 2007. Out of the 10 invited higher institutions in Hong Kong, four have already confirmed their participation before the entry deadline on 31st March including: The Hong Kong Polytechnic University, City University of Hong Kong, The Hong Kong Institute of Education and Hong Kong Institute of Vocational Education. (Three of them have requested to enter two teams.) A webpage has been set up for the event here. The next step of the Hong Kong Federation, says Chairman Chan, is to organise the Hong Kong Closed Championships in the near future. Well organised Racketlon action in Hong Kong. This picture, too, is from last year.